Destiny Rescue began in 2001 with a focus on getting rid of hunger, abuse, and poverty. Since then, they have put their attentions toward raising awareness about child prostitution and made great efforts to raise support for their projects in Cambodia, Mozambique, India, and Thailand. In these places Destiny Rescue rescue the trafficked girls from their abusers and takes them to the safe house where they provide the much needed medical, emotional, and psychological aftercare. Part of the help given is teaching them different trades to prevent them from resorting to prostitution to make money. 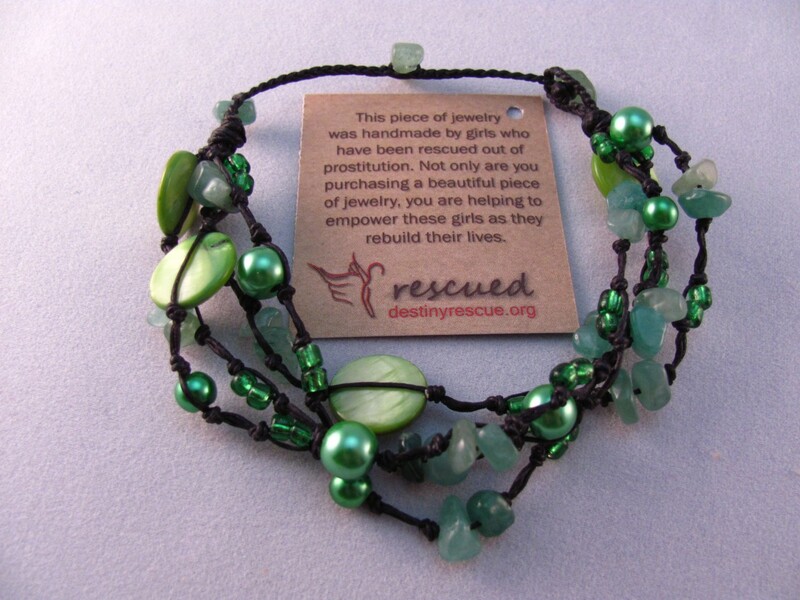 The jewelry, aprons, bags, etc that Destiny rescue sells are actually handmade by these girls they have rescued. I love that these are not just beautiful accessories, but also a connection or bond formed with the girls. One way they sell their jewelry is by having volunteers host jewelry parties which is just what my friend Nikki and I did. Friday, Jan. 20th 2012 we hosted a Destiny Rescue jewelry party at our church (Bay City Wesleyan- 508 W. North Union Bay City, MI 48706). The process was really simple and I would suggest this as an easy way to start your contribution to the cause of re-abolishing slavery. All we had to do was send an email to one of the contacts (a link on their website) and let them know the date of our party, number of people, and whether we were interested in having invitations to send out. They sent us the kit including jewelry/accessories, a short dvd, and pamphlets within a week with no upfront cost to us. Within two weeks after our party, we just sent Destiny Rescue back the unsold products and the money which goes back into helping the children in their programs. To read about our event and maybe get ideas for you own click here: Fashion for Freedom Success!